Oluce in Via Borgonuovo in a setting by Francesco Rota. 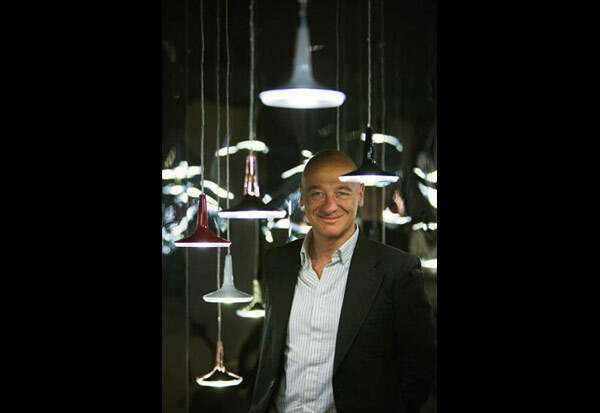 Founded in 1945 by Giuseppe Ostuni, Oluce is the oldest Italian lighting design company still that is still active today. 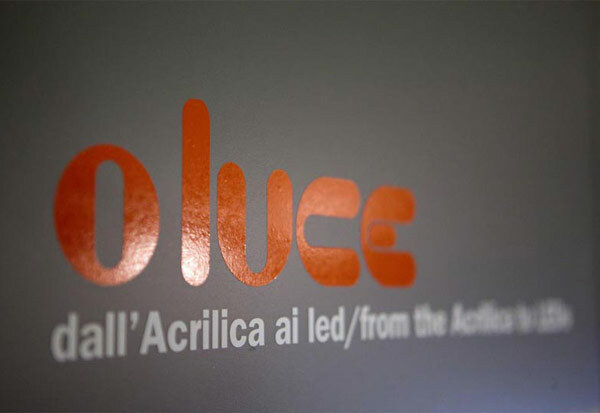 In over 60 years of business, Oluce has worked with some of the major Italian and foreign designers. 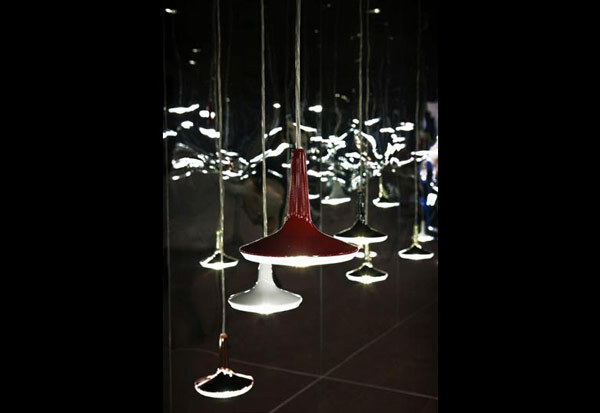 It has won numerous awards, including two Compasso d’Oro design prizes, and its products are on show in the most important museums of decorative art and design around the world. Often, however, Oluce is most remembered for the extraordinary impulse given to the history of forms. For this, it is sufficient to mention”Atollo” by Vico Magistretti, probably the best-known Italian lamp in the world, forgetting an equally important contribution to applied research on light. But let’s take a step back: trivialising it a little, lighting design involves building a “container” that can accommodate a particular light source, with the best combination of aesthetic and performance-related results. So the bulb or source, call it how you will, is therefore something that has always been on the drawing board of lighting designers, next to their pencil, paper and, nowadays, computer. 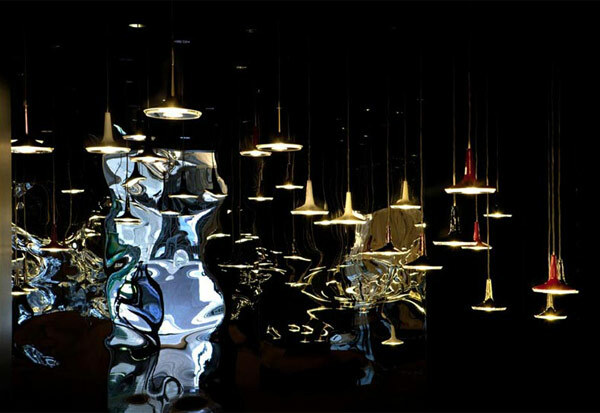 The evolution of bulbs has, we might say, actually been the cause of the very evolution of lighting design. 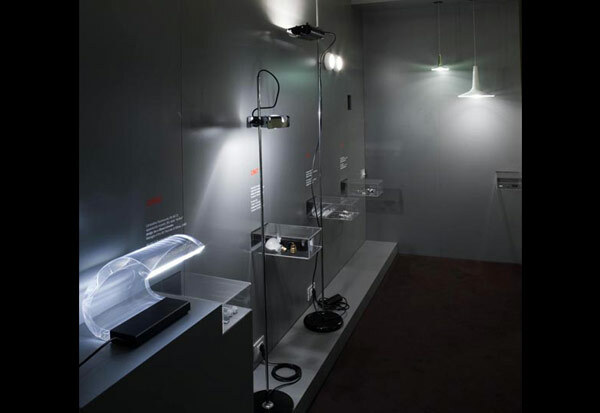 Oluce has played a very important role in this specific story, one which the current exhibition intends to remember. A memory built in stages where each stage is marked by a project that is one of the first in the world to use a new source. And so in 1954 Tito Agnoli, a great, forgotten Italian designer, who recently passed away, used the Cornalux or “hammerhead” bulb just produced by Philips – inventing, with the 387 model, an iconic image for the floor lamp: a simple bulb holder impaled on a chromium-plated stem. No type of reflector was required, as the Cornalux had a partially-mirrored head which was therefore “directed by nature”. 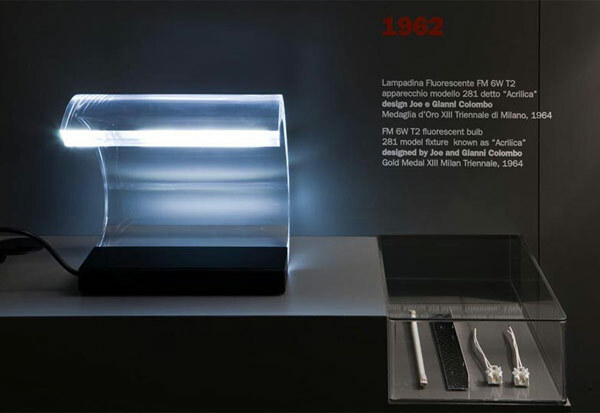 In 1962, it was the turn of Joe and Gianni Colombo to amaze the world with the “Acrilica” project, a lamp that took full advantage of the new potential of the fluorescent source, enclosing it at the base it of a fixture which, like magic, was capable of transporting the glow to the top: the cold fluorescent light found its glorification through the thick curved methacrylate. In 1967, Joe Colombo won the first Compasso d’Oro for Oluce, constructing, in the “Spider“, model, the most perfect “shirt” ever designed, for the Cornalux: the cut in the painted sheet casing makes it possible to appreciate the incredible flat shape of the bulb. Not content with this result, in 1970 Joe Colombo used, for the first time in an article intended for the house, the halogen R7s.15. The result was the 626, model, immediately nicknamed “Alogena” or “Colombo”, a floor lamp with a flat, finned head which, in the years that followed, became a new archetype for this type. 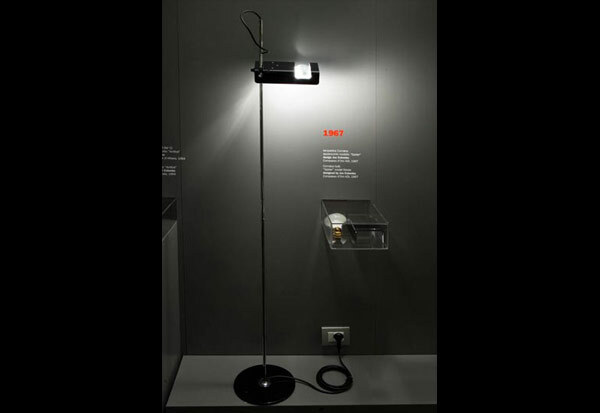 Once again, in 2000, Oluce foresaw the possibility of a new source, the halogen G9, extremely small and with significant power. 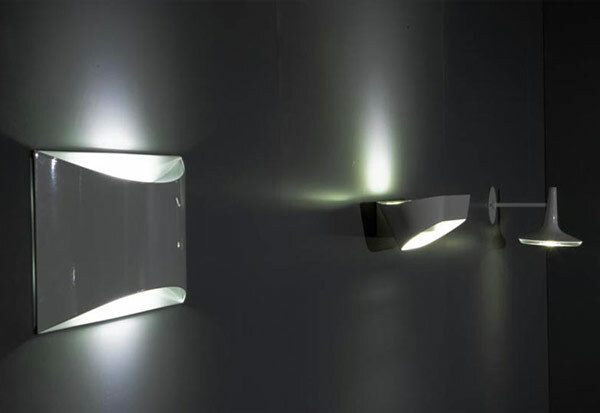 It was decided to use it, reworking a design from the Oluce historical archives dating back to 1960, proposing, in other dimensions, a minimal wall lamp with curved glass lens and aluminium frame: the 1960 (162 model) was reborn, measuring only 13 cm in diameter with a thickness of 5 cm. It was then basically necessary to wait until the beginning of the new millennium for a new revolution to see the light. This time, however, it was something quite unusual: in practice, LED sources postulated the disappearance of the source as we had known it since the 19th century. Indeed, the impact was so powerful that, at times, in the first projects using LEDs, the new source was used somewhat below its potential. And nevertheless, for a decade, the need to use a transformer (which, among other things, has an average life far less than that stated for the LED source) remained. Until 2012. 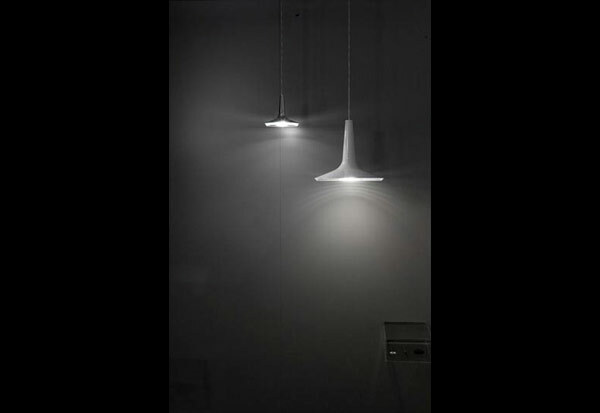 In the “Kin” designed by Francesco Rota, Oluce adopts a brand new LED bulb that works on mains voltage and moreover is dimmable. This leads to an energy saving of nearly 85% compared to a traditional source, which, with equal power, could possibly extend bulb life by 15 times. In the guise of a cast aluminium fixture with the classic “sloping” form, this new illuminated heart shines brightly, truly revolutionary. The groundbreaking story of Oluce, from the Acrilica to LEDs, is told today, following this deliberately brief schedule, in a charming display designed by The groundbreaking story of Oluce, from the Acrilica to LEDs, is told today, following this deliberately brief schedule, in a charming display designed by Francesco Rota.